We’ve been looking into supporting Self-Contained Sequence Representation (SCSR) in Sugar&Splice (NextMove Software’s biologics perception, conversion, and depiction toolkit, as used by PubChem). SCSR is reported (Chen et al. 2011) as a “compressed format that retains chemistry detail”. At NextMove, we’ve long argued that the best way to store peptides for registration is as the full connection table rather than as a compressed form. 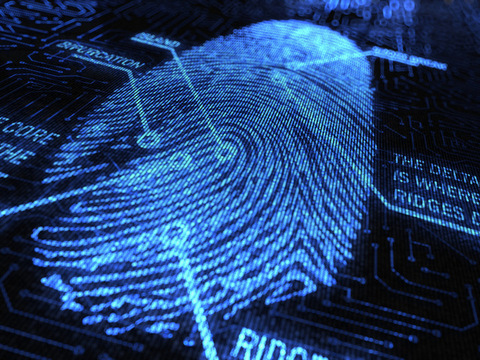 The primary advantage of this is that existing infrastructure for compound registration can be reused with minimal or no changes. On modern hardware, traditional cheminformatics algorithms can easily handle much larger structures (Sayle et al. 2015). 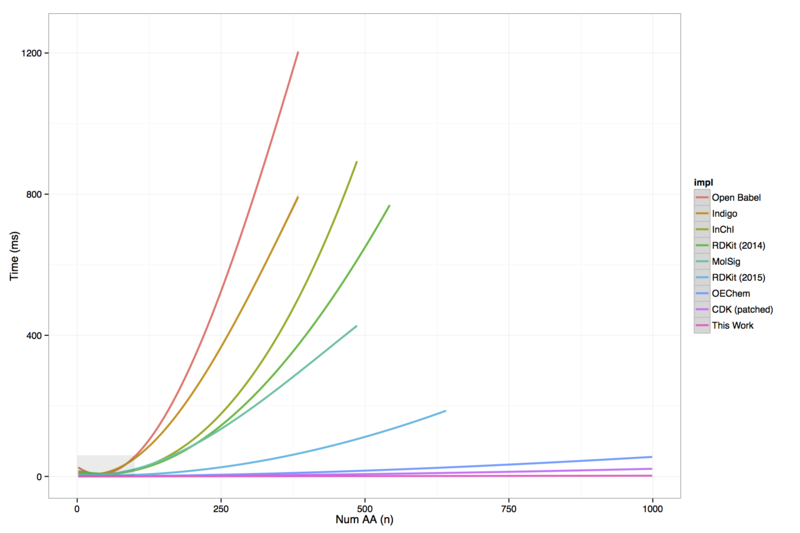 An obvious problem is that without peptide perception (e.g. using Sugar&Splice), duplicates are missed if a user inputs a fully expanded structure instead of a compressed representation. A more subtle problem emerges with modified amino-acids in compressed representations, e.g. 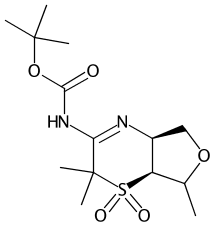 pyroglutamic acid may be considered different it was entered as modified glutamic acid or proline. Having distinct registration systems for peptides and compounds is more complex and therefore more error prone, and more expensive to maintain. 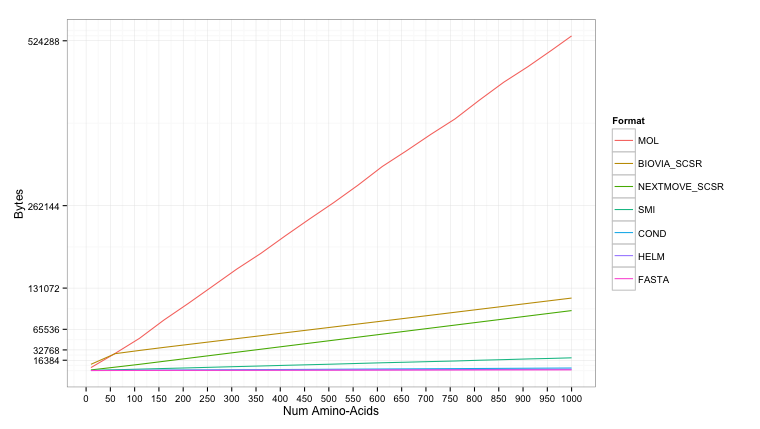 To test how the size of these representations scales with the peptide length, random linear unmodified peptides were generated of increasing size. The formats listed above were tested as well as the fully expanded molfile and BIOVIA generated SCSR (BIOVIA Direct 2017). 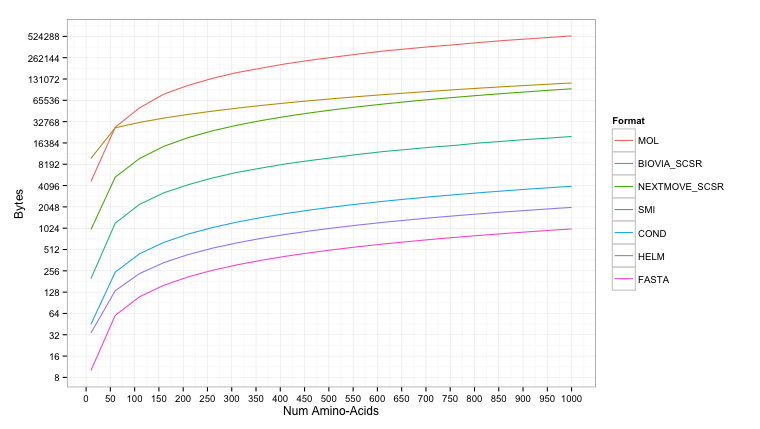 The difference between the BIOVIA SCSR and the NextMove SCSR (shown above) is that the expanded template for each occurring standard amino acid is included (i.e. a monomer definition). This has a little storage overhead that varies depending on the number of unique monomers. The results are shown below. The molfile gets reasonably large (max 500KB+), though even this could still be stored on modern hardware. The SMILES (max 16KB+) peaks just above the more condensed formats of FASTA (max 1KB), HELM (max 2KB+), and Condensed (max 4KB+). William L. Chen, Burton A. Leland, Joseph L. Durant, David L. Grier, Bradley D. Christie, James G. Nourse, and Keith T. Taylor. Self-Contained Sequence Representation: Bridging the Gap between Bioinformatics and Cheminformatics. JCIM. 2011, 51, 2186. Chemical structure diagrams are essential in describing and conveying chemistry. Extracting chemistry from documents using text-mining (see NextMove Software’s LeadMine) is extremely useful but will miss anything described only by an image. As a general approach to mining chemistry from images, one may consider using image-to-structure programs such as: OSRA, CliDE, ChemOCR, and Imago OCR. However, image-to-structure is not easy or quick and can be prone to compounding errors (e.g. OCR). At NextMove we approach this problem slightly differently. It turns out that in some cases the source sketch files used to create the chemical diagrams may be available and provide a ‘cleaner’ data source than the raster images. Although the data is ‘cleaner’ in terms of digital representation, naïvely exporting the connection table stored in a sketch file can lead to artificial and erroneous structures. 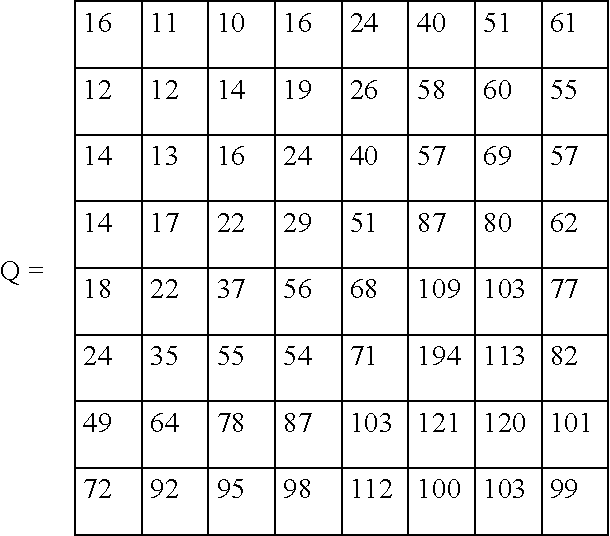 The main problems stem from the stored representation (connection table) imprecisely reflecting what is displayed. To account for these issues, the NextMove Software converter (code name: Praline) applies correction, interpretation, and categorisation to sketches. The transformed connection table (currently written as ChemAxon Extended SMILES [CXSMILES]) better reflects what is actually displayed. Compound 2-2 was not correctly extracted and looks like OCR has mistakenly recognised the -OBn as -OBu. 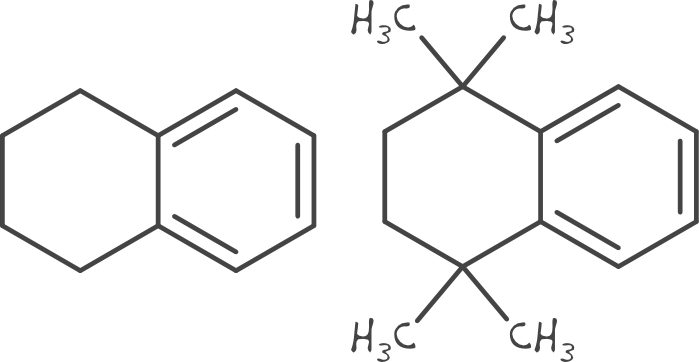 The flurobenzene probably comes from Compound 9-1 where the label (Boc)2N- is difficult to recognise. The products of Step 4 contain valence errors and were probably thrown out as a recognition error. Line Formula Parsing – Using a strict yet comprehensive algorithm condensed labels are corrected and expanded. Reaction Role Assignment – The reaction scheme layout is common to patents and made easier by looking for the USPTO-specific ‘splitter’ tag. To make valid reactions, reactants are duplicated and added to the previous step. Agent Parsing – Based on the location the complete label “Boc2, DIEA” can be correctly processed. Agents can be a mix of trivial names, systematic names and formulas. Clear Ambiguous Stereochemistry – One of the hashed wedges in Compounds 9-1, 9-2, and 9-3 is poorly placed between two stereocenters. In the stored representation both stereocentres are defined but we remove the definition at the wide end of the wedge. Category Assignment – Based on the content we tag the output with a category for quick filtering. This is described more in the poster (see below). Compounds 2-2 and 9-1 are now correctly extracted and actually novel to PubChem. We don’t try to correct author errors and so the bad valence is also preserved as drawn in Step 4. 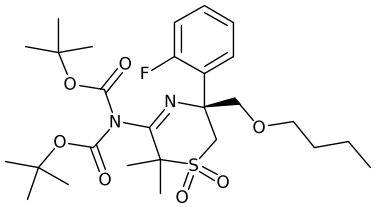 US 7092578 B2 is not a chemical patent but does have ChemDraw files. 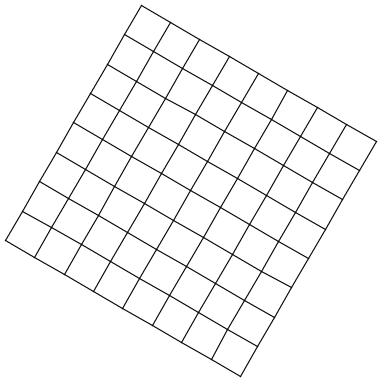 Here ChemDraw has been misused to draw tables, and direct export results in a cyclobutane grid. These are a well known class of bad structures in PubChem and have been referred to as chessboardanes. In addition to extracting the chemical structure, Praline assigns a categorisation code. This allows us to flag structures with potential problems as well as those with no real chemistry at all. Praline assigns the category No Connection Table and so it can be easily ignored. Strange connection tables don’t just come from non-chemistry patents, US 6531452 B1 like many chemistry patents contain a generic (Markush) claim. Earlier we saw the label -OBn misread by OCR. Even without OCR a condensed label may be expanded wrongly in the underlying representation, particular if the structure is generic. Image-to-structure is slow; due to this, SureChEMBL currently has only processed images using image-to-structure from 2007 onwards (Papadatos G. 2015). In contrast Praline can process the entire archive of US Patent Applications and Grants with more than 24 million ChemDraw files (2001 onwards) in only 5 hours (single threaded). Although the naïve molfile exports from the ChemDraw sketches are provided by the USPTO they have less information than the source ChemDraw sketch file. 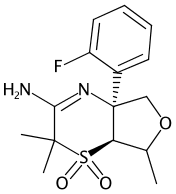 Reading the pre-exported molfile is significantly less accurate than interpreting the ChemDraw sketch, and even image-to-structure often produces more accurate results. Other than U.S. Patents, this technology can be applied to sketch files extracted from Electronic Lab Notebooks (see NextMove Software’s HazELNut) as well as Journals where the publishers have held on to the sketch file submissions. At the upcoming ACS in Philadelphia, Daniel will be presenting how some structures can only be extracted when the output from text-mining and sketches are combined. “The whole is greater than the sum of the parts” – Aristotle. We’ve previously shown using all-atom structure representations is a tractable approach to handling biologics (see https://nextmovesoftware.com/blog/2014/11/). Handling biologics in this way allows you to reuse existing registration infrastructure (e.g. Canonical SMILES/InChI/CACTVS keys). 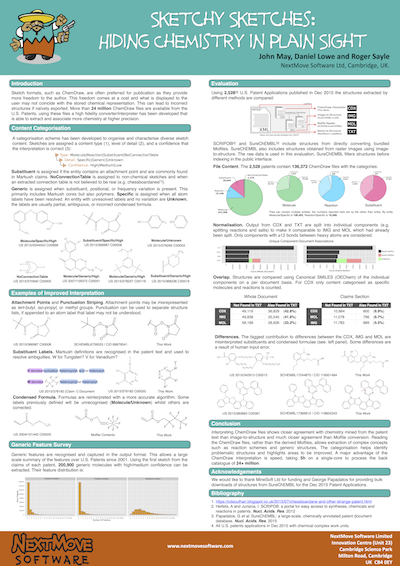 At the Fall ACS ’15, Roger presented an update to this on-going work showing that many popular open-source cheminformatics toolkits can already handle peptides < 500 AA (the size of immunoglobulin heavy chains) in less than a second. We timed the generation of a canonical SMILES string (from the internal representation) over SwissProt. With the exception of Indigo/CDK (that hit hard error limits) the lines stop due to time constraints. One thing the timings highlighted was recent improvements in RDKit that show faster canonicalisation and and reduced scatter (similar size structures ~ same amount of time). CDK was originally limited by the number of primes listed (it uses product of primes for refinement); patching the CDK to use more primes allows it to encode biopolymers of over 1000 AA. Substructure Search Face-off: Are the slowest queries the same between tools? At the recent Cambridge Cheminformatics Network Meeting (CCNM) we presented a performance benchmark of substructure searching tools using the same queries, target dataset, and hardware. 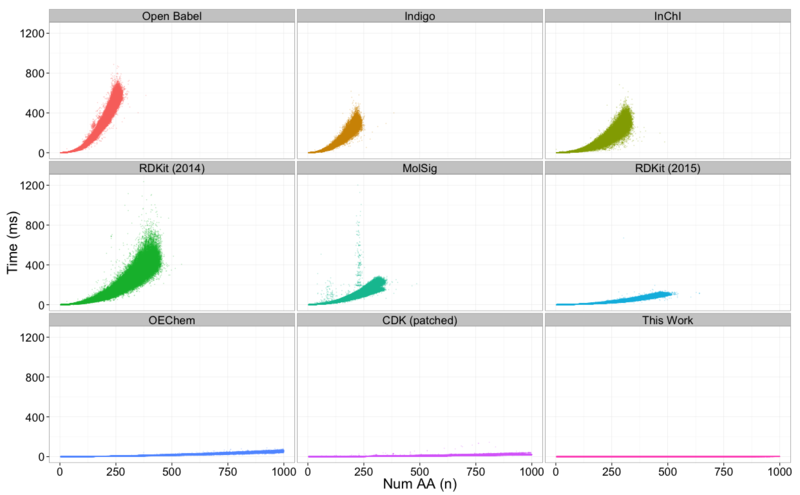 Whilst many tools publish figures for isolated benchmarks, the use of different query sets and variations in target database size makes it impossible to determine how tools compare to each other. The talk compared the performance of various tools and offers insight in to the performance characteristics. A question was asked at the talk as to whether the slowest queries were always the same. As expected there is some correlation (benzene is always bad) but there are some rather dramatic differences within and between tools. For example, the time taken to query Anthracene or Zinc varies with some tools finding Anthracene hits faster (marked as <) and others finding Zinc faster (marked as >). The rank of slowest queries (per tool) is provided as a guide to how many queries took more time than listed here. As promised the query and target ids are available: here. If this is an area of interest to you feel free to get in touch. Posted on June 1, 2015 June 1, 2015 Author John Mayfield3 Comments on Substructure Search Face-off: Are the slowest queries the same between tools?